Luckless Lucina is an Imperial beggar living in Cheydinhal. Her bedroll and food bag can be found behind Willow Bank, against the city wall. She lives the typical life of a beggar, waking up at 6am every day and heading immediately to the west gate of the city to stroll around and beg for food and money. 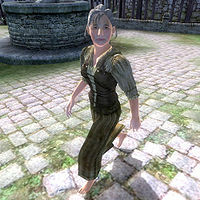 Having no success she will move to the plaza in front of the Cheydinhal Mages Guild at 10am, were she will wander around asking for help. At 2pm she will move again, this time to a more suitable spot in front of The Great Chapel of Arkay, to continue begging until 6pm. At that time she will return to her bedroll to grab a piece of food and have a two-hour-long dinner. After she has finished eating she will return to strolling around her bedroll until 10pm, when she goes to bed. On rainy days she heads to Riverview, taking cover under the porch awning until the rain stops. Her attire consists of a single shirt with suspenders combined with belted braies. As a beggar, she has limited resources in combat, relying only on her fists. You can contract the disease serpiginous dementia from her. She is one of the few people that can give you the necessary information about how you may be able to join the Thieves Guild and will also aid you during The Elven Maiden quest.